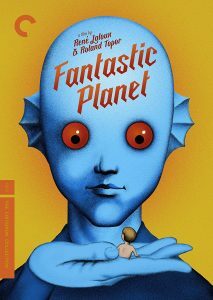 Based on French science fiction novelist Stefan Wul’s Oms en Serie (“Oms by the Dozen”), René Laloux’s La Planète Sauvage (its title changed to Fantastic Planet for the U.S. release) paints an animated tale of humans kept as domesticated pets by an alien race of blue humanoid giants called Traags. The story takes place on the Traags’ planet Ygam, where we follow our narrator, an Om called Terr, from infancy to adulthood, when he escapes his subjugation with a Traag learning device with which to educate the savage Oms and incite them to revolt. As a French-Czech coproduction, this story had much resonance for its makers as an allegory of Czechoslovakia’s invasion by Soviet troops in the late ’60s, and had to be completed in Paris due to political pressure.